1) Chicken with Preserved Lemons and Olives (page 313) : My first attempt at jointing a chicken, which went well thanks to Hugh's pictorial guide. I settled on this recipe in particular because I had a jar of homemade preserved lemons and a can of olives plus other ingredients already in the pantry. This recipe was easy-to-make (Note: I used tomatoes I preserved instead of fresh since they are not currently in season). Despite its Heritage pedigree, this chicken dish was fairly average in my book and I don't think I would make it again, but I am not sure if it was the recipe or my ingredients that were fault. I also took this dish to a potluck which meant it was perhaps cooked (reheated) longer than was necessary, resulting in chicken that wasn't as succulent as it should have been. 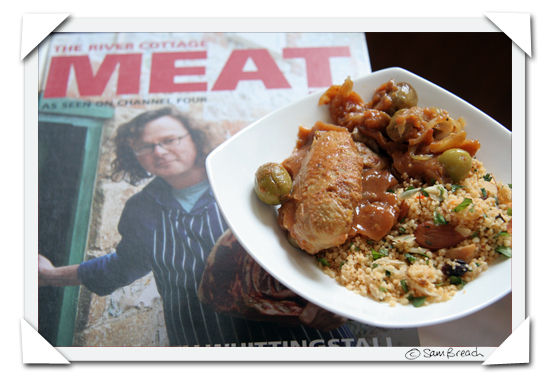 2) Special Couscous (page 521): This side dish, on the other hand was a hit. So easy to throw together and a great mix of strong flavours (from the lemon, coriander leaves and mint) and textures - from the soft grains of pasta to the crunchy toasted almonds. Would definitely turn to this dish again. Fast and impressive. Great for a picnic or potluck. Easy to adapt with whatever ingredients you have on hand. Note: These recipes were taken from the British version of the book. An edition of the River Cottage Meat Book has been tailored for the American audience and will be available from Tenspeed press in April. 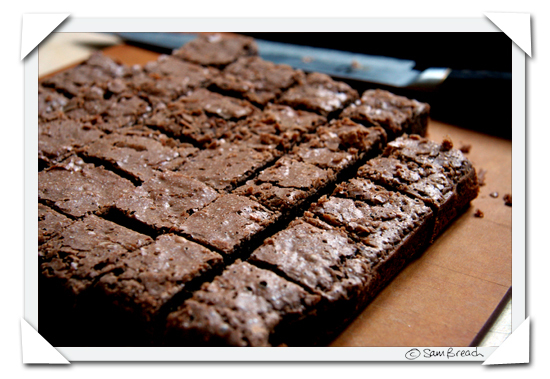 Fudge Brownies (page 99): Described as "not a cake, not a candy, these dense squares are a bit of each". An extremely simple set of instructions in a book that is full of far more time-consuming recipes, these brownies were a success with my office mates. My only criticism is that when you add the flour to the warm chocolate mixture, it tends to form little clumps and air pockets, despite having been carefully sieved. I don't think anyone noticed but me. I would also recommend cutting this into 25 instead of 16, the brownies are rich enough that a smaller square is equally as satisfying. I would make this again. I've already written about my experience of making this oxtail stew. A few weeks later, I feel differently about this recipe. In fact - I am kind of obsessing about the memory of it and am getting antsy to try it again. The next time there will be no surprises - I'll not be scared when my kitchen almost catches on fire and I'll buy more reasonably priced wine specifically for the occasion instead of using favourite, pricey bottles from my cellar. Don't be surprised if you hear I've made this a second time. The deliciousness of this dish still haunts me. 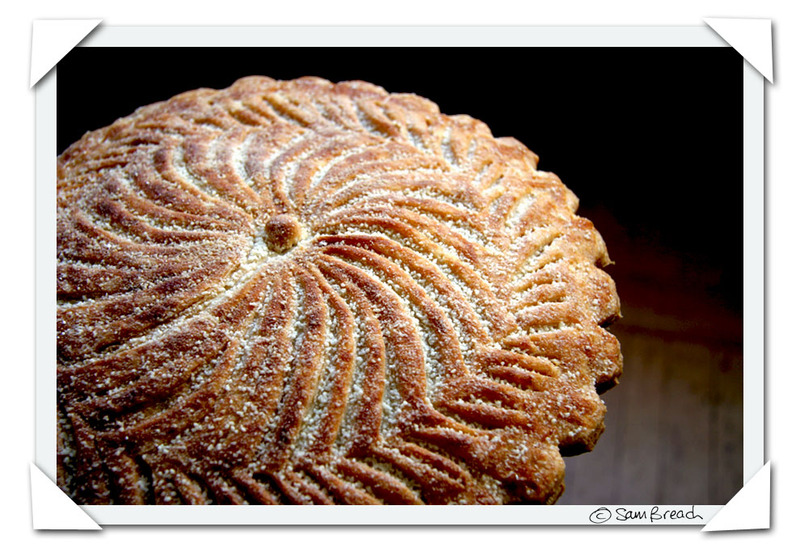 When I realised that the recipe for Pithiviers is exactly the same as the one for Galette des Rois, I turned to my Cordon Bleu tome to find the instruction for making this Epiphany cake. If you'd read my post at the time, you'd know I totally cheated and bought the puff pastry, ready made. Doing so ensured this recipe was a doddle to make and the results were superb. Even cutting the pattern on the top worked out more perfectly than I imagined it would. The only caveat - the powedered sugar I sprinkled on the top did not melt into a glaze. Maybe this was because I was using the organic, unbleached variety which I have found behaves differently to the regular type. I am going to have to experiment with a better glaze next time. Yes - I am most definitely going to be making this delightful dessert again. I was looking to find a recipe for celery and stilton soup to use up some leftovers I had sitting in my fridge. This recipe was totally delicious but the results weren't what I had pictured in my mind when I started out. Cream and potato, along with the pungent cheese, were in the forefront of this rich soup, but I wanted more of the celery to shine through. No, I won't be making this version again and I am sure my arteries will thank me for that, but if you are in to creamy, cheesey soup this one won't disappoint. A batch of these cookies are eaiser than easy to whip up, just remember the dough needs to settle in the fridge overnight before baking. The result is an extremely buttery almost shortbread-like cookie with a subtle hint of cardamom. My only query about this recipe is that it contains cornstarch and I don't understand why. I can't help but wonder how they'd be if I made them without it. I might try these again one day to find out. Easy to make and a definite crowd pleaser - great for feeding large groups. Be sure to us only the best quality ingredients - the success of this recipe relies on them. 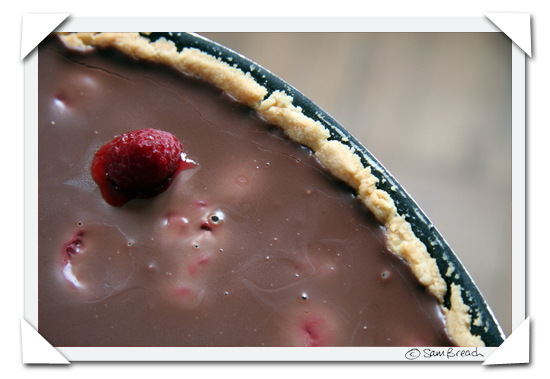 Read more about my experience making this tart here. 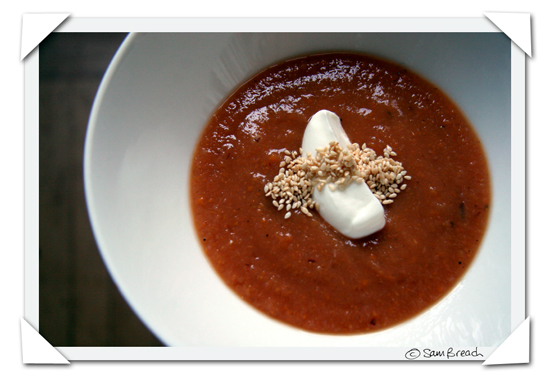 "Ot Ot Soup" was my interpretation of the New England Carrot, Apricot and Sesame Soup (page 39). I like this soup, but maybe my first description of it would be "interesting". I am not averse to making this again, but neither am I in any great hurry to do so. Great resolution. I wish I'd thought of that one. I think I may have achieved it though without realising. I actually thought the chicken looked good. Well infact everything you do looks, and I'm sure tastes good. But I agree reheating does often affect the texture of some food. Are those brownies better than the Martha brownie recipe you posted at one point? I wanted to post a big ol' LOL over the Joel Robuchon post. I couldn't get past the decor when we ate there. It seriously interfered with my meal! Ah, good to know about the no-knead wheat bread. I tried replacing half the white flour with wheat... the bread was okay, but not quite as good as all-wheat. I'll try using 1 cup instead of 1.5! 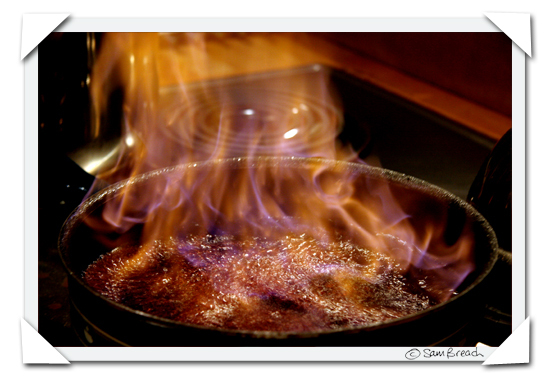 Great post and an admirable grouping of recipes to try. I had a wonderful oxtail soup at an inn this weekend that I will post about soon. It made me want to try it at home, and this post gave me more inspiration. Thanks! cornstarch often appears in shortbread-y recipes because it creates an old world texture-- light without aeration, which of course you don't really want in unleavened cookies. In really old recipes you will see proportions that err heavily on the side of these sorts of ingredients. especially where wheat was not grown, or out of season, or cost prohibitive. I haven't tried the special couscous either, though, and now I know I must! Thanks for the recipe testing. A new recipe every week...I wonder if I do that? I wonder if I *should* do that? us has olives in it too, but I had problems with my olives and left them out that day, so you could do that too - still delicious. You have been busy in the kitchen! Everything looks amazing! I take tai chi with Fran Gage -- I'll pass on your comments on the recipe. What a fun resolution. I love the picture of the oxtail stew and glad to hear you and your kitchen survived the ordeal. My (British) mother-in-law gave me the Hugh F-W MEAT cookbook last year for my birthday. I LOVE the beef in Guinness stew recipe. Did you buy all of these cookbooks this year too from which these recipes came from? Terrific idea. You've tempted me to try a few new recipes, just have to get off the wii! I did not know that there was a River Cottage Cookbook - I am going to have to add it to my shopping list. Organic sugar doesn't carmelize very well because it's too dirty, meaning it's got too many non-sugar objects in it. It isn't washed, filtered, and processed as much as regular sugar. A little tidbit I learned at Shuna's caramel class :).